While we’ve seen other games following the same concept as Wormax, the game gets good with time. The main idea is simple: either eat or be eaten. So, when you start playing the game, your primarily goal will be to eliminate all enemies. The graphics are pretty decent, and we were also impressed by the music. So, in case you’re looking to know more about this game, here’s everything you have to know. This game comes with plenty of quirky features like super skills and boosters. Although they are available in different variants, these features are nothing but power-ups that can be used at any point of the game. Other impressive features include the acceleration stop and ghost option. These are rechargeable abilities that can be pumped up at any given time. Acceleration, as evident from the name offers a short speed boost in the game. This is the most common skill since it is the simplest way to attach other players. Stop is yet another defensive ability that let’s your worm freeze for around five seconds. Finally, Ghost’ is the feature that makes your worm’ completely transparent. To put it simply, it allows you to slide through other players without any grave consequences. You will randomly find boosters throughout the entire game. Some of them are the Toxic Telescope, the Mass Conservation, and the Health. Each of these boosters will activate a special power for 60 seconds. As every player looks forward to boosters, these power-ups will enhance the overall competition. Yet another fantastic feature of this game is the League System’. You can use this feature to track your progress along with others right after the registration. Instead of merely leveling up’, the experienced players get a chance to participate in the high-ranking leagues. And the best part: you will get an essence’ bonus when you enter a new league. You can then use this essence on the various artifacts of the shop. You use this essence for enhancing your attributes. 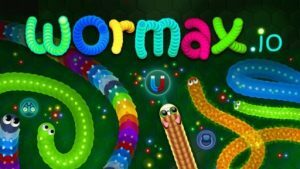 Wormax.io totally ups the graphics game with its bright hues, fun skins, intuitive animations. Each of these boosters come with unique icons and are extremely easily accessible throughout the arena. The Wormax.io shop too is teeming with equally great graphics. Once you share a link of the game on your social media platform, you’ll be eligible to enjoy a host of other colorful skins. These, in turn, will be pep up the entire look of the game thereby ensuring that now two players are accidentally mistaken to be the same. This game, with its innovative features and functionalities will totally live up to your expectations. So play online with hundreds of others across the globe, play with the single user mode, collect boosters and play with your friends to make the most of this fun and intuitive game.